A 106-acre master planned tourist/commercial subdivision containing four hotels, 1,150 units, 100,000 SF of festive retail, four restaurants and 330 time share units. - Orlando Premium Outlets (Barry W. PD) - A 80-acre commercial tourist center anchored by the 480,000 SF Orlando Premium Outlet Mall. In addition a 350 unit Hilton vacations time-share resort and 400 Hotel rooms. 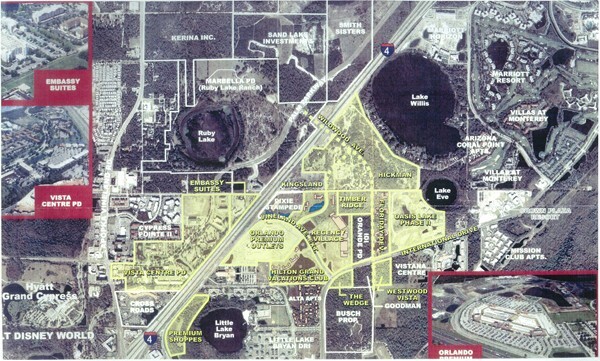 - Tinwood PD - A 56-acre commercial center with 140,000 SF Publix based center, 705 Hotel rooms (three sites) and 9 parcels also serving as the chairman of the developers Architecture Review Committee. - Vineland Point PD - A 487 acre residential community with 1,557 units, an elementary and middle school, parks, and a master road agreement. - Vineland Ave Extension - Four land owners agreements with Orange County to open 150 acres of tourist commercial development and separate properties to individual developments to remain below the DRI threshold. - Wildwood/Fenton St. - A four-land-owner planned boulevard with a flyover of I-4 positioned as a future Interchange.